Dump Me was set up when we saw the need for a simple, quick and straightforward service that anyone can use. We have been operating in the Auckland region for over 10 years now. We have a great team of employees dedicated to solving our customer’s problems and we are happy to discuss all your waste removal and rubbish removal requirements – no matter how big or small. In addition to providing you with the most hassle-free service possible, we are also committed to sustainable rubbish management, and reducing the amount of rubbish that goes into landfills. We provide recycling solutions wherever possible. We pride ourselves on helping to streamline local recycling, rehoming and smart rubbish solutions. We also work closely with charities such as Auckland Hospice, who are very appreciative of this service. After all, one man’s rubbish is another man’s treasure! We will try to give you a price indication over the phone from the description of items or nature of rubbish you discuss with our customer service. If you are happy with the price indication we can then arrange for a Dump Me rubbish removal truck to make a stop at your property to give an onsite quotation. The quotes are totally free and there is no obligation to proceed. Should you accept the quote and wish to proceed, the truck team will quickly load the rubbish on to the truck and sweep up afterwards leaving the property tidy and clean. 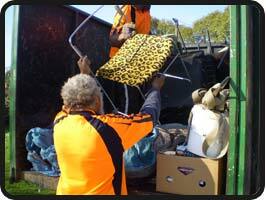 Our team of rubbish removal experts will do all the time-consuming rubbish loading and removal for you. We’ll even haul the rubbish from the back of your property. We offer a cost-effective solution: prices include labour, removal and all disposal fees, and there are no hidden costs when you use the Dump Me rubbish removal service. For your convenience, we operate seven days a week and you will be surprised at how quick our turn-around is. Customers really appreciate the reliable service we provide. Give us a call now for a free quote with no strings attached. Call 0800DUMPME.